Beautifully engraved certificate from Hoboken Ferry Company issued in 1897. 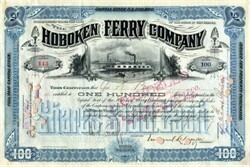 This historic document was printed by the Homer Lee Banknote Company and has an ornate border around it with a vignette of the Hoboken Ferry in Bergen, New Jersey. This item has the signatures of the Company’s V. President, Emanuel Lehman and Treasurer and is over 116 years old. Punch cancelled. LEHMAN, EMANUEL, merchant, a native of the village of Rimpar, near Wurzburg, Germany, was born Feb. 15, 1827. His parents, who were of German-Hebrew descent, gave their son a sound training both at home and in the high school in Wurzburg and the lad then entered upon the practical work of life. At that period, many Germans had learned of the better opportunities presented by the new world and were exchanging homes in the fatherland for a residence in the Southern States. Following this movement, Mr. Lehman sailed for America in 1847 and joined his brother Henry, a merchant in Montgomery, Ala., since 1844, in the management of a general store. They were diligent and hard working men, and as they prospered drifted naturally into a factorage and cotton business. To enable a cotton planter to cultivate his crop, it is necessary for him to resort to some neighboring general merchant, who will advance to him a large amount of supplies and carry him along to the time when the crop can be harvested and sold. The intimate relations of the Lehman Bro's with the cotton planters resulted in the development of an extensive trade, both in supplies and in cotton. The staple they shipped to the north and to Europe. In 1856, the Lehman Bro's found themselves compelled by a growing business to establish a house in New York city, and Emanuel Lehman was placed in charge of it. The Civil War caused a serious interruption in the operations of the New York house, but, in 1865, it was re-established by Emanuel Lehman, the younger brother, Mayer, remaining in Montgomery for a while in charge of the Southern business, which is yet conducted under the name of Lehman, Durr & Co. They also established a commission business in New Orleans in 1865 under the title of Lehman, Newgass & Co., now known as Lehman, Stern & Co. All three firms are now prominent in their respective cities and deal in cotton, sugar, coffee, etc. Emanuel Lehman, senior partner in the firm, has made his home in New York since 1856. After the War, the brothers Lehman devoted themselves to a task which has enlisted the sympathy and active interest of every progressive and public-spirited man in the South, namely, a revival of the interests prostrated by the War and a development of the theretofore scarcely exploited natural resources of the region. In 1865, the State of Alabama being impoverished, the Lehman Bro's furnished $100,00 to defray the expenses of the first convention, held under the reconstruction act, and afterward acted as fiscal agents for the State, retaining this relation until Alabama came under the control of the Radicals, about 1871. By their investments, they promoted the reorganization of railroad companies, the improvement of real estate, the building of iron furnaces and other factories, and the opening of coal mines. They now have large interests in these properties and have aided largely in building several Southern railroads. They are also principal owners of two excellent and prosperous cotton mills, one operated by The Tallassee Falls Manufacturing Co., near Montgomery; the other, the Lane Mills in New Orleans. Mr. Lehman is a director of The Mercantile National Bank, The Queens County Bank on Long Island, The Alabama Mineral Land Co., The Berry-Boice Cattle Co., The Metropolitan Ferry Co., and The Tenth & Twenty-third Streets Railroad Co., and The Third Avenue Railroad. He displays the marked philanthropy so characteristic of his race, and cordially supports the Hebrew charities of the city and serves as president of The Hebrew Orphan Asylum. In May, 1859, he married Pauline, daughter of Louis Sondheim of New York. His wife died in 1871, leaving four children: Milton; Philip a partner in the firm; Harriet and Eveline. Mr Lehman is a member of the Southern Society and highly respected in business circles in this city. In 1844, 23-year-old Henry Lehman, the son of a cattle merchant, emigrated to the United States from Rimpar, Bavaria. He settled in Montgomery, Alabama, where he opened a dry-goods store, "H. Lehman". In 1847, following the arrival of Emanuel Lehman, the firm became "H. Lehman and Bro." With the arrival of their youngest brother, Mayer Lehman, in 1850, the firm changed its name again and "Lehman Brothers" was founded. In the 1850s Southern United States, cotton was one of the most important crops. Capitalizing on cotton's high market value, the three brothers began to routinely accept raw cotton from customers as payment for merchandise, eventually beginning a second business trading in cotton. Within a few years this business grew to become the most significant part of their operation. Following Henry's death from yellow fever in 1855, the remaining brothers continued to focus on their commodities-trading/brokerage operations. By 1858, the center of cotton trading had shifted from the South to New York City, where factors and commission houses were based. Lehman opened its first branch office in New York City's Manhattan borough at 119 Liberty Street, and 32-year-old Emanuel relocated there to run the office. In 1862, facing difficulties as a result of the Civil War, the firm teamed up with a cotton merchant named John Durr to form Lehman, Durr & Co. Following the war the company helped finance Alabama's reconstruction. The firm's headquarters were eventually moved to New York City, where it helped found the New York Cotton Exchange in 1870; Emanuel sat on the Board of Governors until 1884. The firm also dealt in the emerging market for railroad bonds and entered the financial-advisory business. Despite the offering of International Steam, the firm's real shift from being a commodities house to a house of issue did not begin until 1906. In that year, under Philip Lehman, the firm partnered with Goldman, Sachs & Co., to bring the General Cigar Co. to market, followed closely by Sears, Roebuck and Company. During the following two decades, almost one hundred new issues were underwritten by Lehman, many times in conjunction with Goldman, Sachs. Among these were F.W. Woolworth Company, May Department Stores Company, Gimbel Brothers, Inc., R.H. Macy & Company, The Studebaker Corporation, the B.F. Goodrich Co. and Endicott Johnson Corporation. Following Philip Lehman's retirement in 1925, his son Robert "Bobbie" Lehman took over as head of the firm. During Bobbie's tenure, the company weathered the capital crisis of the Great Depression by focusing on venture capital while the equities market recovered. By 1928, the firm moved to its now famous One William Street location. Traditionally, a family-only partnership, in 1924 John M. Hancock became the first non-family member to join the firm, followed by Monroe C. Gutman and Paul Mazur in 1927. In the 1930s, Lehman underwrote the initial public offering of the first television manufacturer, DuMont, and helped fund the Radio Corporation of America (RCA). It also helped finance the rapidly growing oil industry, including the companies Halliburton and Kerr-McGee. Pete PetersonIn the 1950s, Lehman underwrote the IPO of Digital Equipment Corporation. Later, it arranged the acquisition of Digital by Compaq. Robert Lehman died in 1969, and since that time, no member of the Lehman family has led the company. Robert's death left a void in the company, which, coupled with a difficult economic environment, brought hard times to the firm. In 1973, Pete Peterson, Chairman and Chief Executive Officer of the Bell & Howell Corporation, was brought in to save the firm. Upset bankers, who had soured over the power struggle, left the company. Steve Schwarzman, chairman of the firm's M&A committee, recalled in a February 2003 interview with Private Equity International that "Lehman Brothers had an extremely competitive internal environment, which ultimately became dysfunctional." The company suffered under the disintegration, and Glucksman was pressured into selling the firm to Shearson, an American Express-backed electronic transaction company, in 1984, for $360 million. On May 11, the combined firms became Shearson Lehman/American Express. In 1988, Shearson Lehman/American Express and E.F. Hutton & Co. merged as Shearson Lehman Hutton Inc. Despite rumors that it would be acquired again, Lehman performed quite well under CEO Richard S. Fuld, Jr.. In 2001, the firm acquired the private-client services, or "PCS", business of Cowen & Co. and later, in 2003, aggressively re-entered the asset-management business, which it had exited in 1989. Beginning with $2 billion in assets under management, the firm acquired the Crossroads Group, the fixed-income division of Lincoln Capital Management and Neuberger Berman . These businesses, together with the PCS business and Lehman's private-equity business, comprised the Investment Management Division, which generated approximately $3.1 billion in net revenue and almost $800 million in pre-tax income in 2007. Prior to going bankrupt, the firm had in excess of $275 billion in assets under management. Altogether, since going public in 1994, the firm had increased net revenues over 600% from $2.73 billion to $19.2 billion and had increased employee headcount over 230% from 8,500 to almost 28,600. On September 11, 2001, Lehman occupied three floors of One World Trade Center where one employee was killed. Its global headquarters in Three World Financial Center were severely damaged and rendered unusable by falling debris, displacing over 6,500 employees. The bank recovered quickly and rebuilt its presence. Trading operations moved across the Hudson River to its Jersey City, New Jersey, facilities, where an impromptu trading floor was built and brought online less than forty-eight hours after the attacks. When stock markets reopened on September 17, 2001, Lehman's sales and trading capabilities were restored. In the ensuing months, the firm fanned out its operations across the New York City metropolitan area in over forty temporary locations. Notably, the investment-banking division converted the first-floor lounges, restaurants, and all 665 guestrooms of the Sheraton Manhattan Hotel into office space. The bank also experimented with flextime (to share office space) and telecommuting via virtual private networking. In October 2001, Lehman purchased a 32-story, 1,050,000-square-foot office building for a reported sum of $700 million. The building, located at 745 Seventh Avenue, had recently been built, and not yet occupied, by rival Morgan Stanley. With Morgan Stanley's world headquarters located only two blocks away at 1585 Broadway, in the wake of the attacks the firm was re-evaluating its office plans which would have put over 10,000 employees in the Times Square area of New York City. Lehman began moving into the new facility in January and finished in March 2002, a move that significantly boosted morale throughout the firm. The firm was criticized for not moving back to its former headquarters in lower Manhattan. Following the attacks, only Deutsche Bank, Goldman Sachs, and Merrill Lynch of the major firms remained in the downtown area. Lehman, however, points to the facts that it was committed to stay in New York City, that the new headquarters represented an ideal circumstance where the firm was desperate to buy and Morgan Stanley was desperate to sell, that when the new building was purchased, the structural integrity of Three World Financial Center had not yet been given a clean bill of health, and that in any case, the company could not have waited until May 2002 for repairs to Three World Financial Center to conclude. After the attacks, Lehman's management placed increased emphasis on business continuity planning. Unlike its rivals, the company was unusually concentrated for a bulge-bracket investment bank. For example, Morgan Stanley maintains a 750,000-square-foot trading-and-banking facility in Westchester County, New York. The trading floor of UBS is located in Stamford, Connecticut. Merrill Lynch's asset-management division is located in Plainsboro Township, New Jersey. Aside from its headquarters in Three World Financial Center, Lehman maintained operations-and-backoffice facilities in Jersey City, space that the firm considered leaving prior to 9/11. The space was not only retained, but expanded, including the construction of a backup-trading facility. In addition, telecommuting technology first rolled out in the days following the attacks to allow employees to work from home was expanded and enhanced for general use throughout the firm. In 2003, the company was one of ten firms which simultaneously entered into a settlement with the U.S. Securities and Exchange Commission (SEC), the Office of the New York State Attorney General and various other securities regulators, regarding undue influence over each firm's research analysts by their investment-banking divisions. Specifically, regulators alleged that the firms had improperly associated analyst compensation with the firms' investment-banking revenues, and promised favorable, market-moving research coverage, in exchange for underwriting opportunities. The settlement, known as the “global settlement”, provided for total financial penalties of $1.4 billion, including $80 million against Lehman, and structural reforms, including a complete separation of investment banking departments from research departments, no analyst compensation, directly or indirectly, from investment-banking revenues, and the provision of free, independent, third-party, research to the firms' clients. In August 2007, the firm closed its subprime lender, BNC Mortgage, eliminating 1,200 positions in 23 locations, and took an after-tax charge of $25 million and a $27-million reduction in goodwill. Lehman said that poor market conditions in the mortgage space "necessitated a substantial reduction in its resources and capacity in the subprime space". In 2008, Lehman faced an unprecedented loss to the continuing subprime mortgage crisis. Lehman's loss was apparently a result of having held on to large positions in subprime and other lower-rated mortgage tranches when securitizing the underlying mortgages; whether Lehman did this because it was simply unable to sell the lower-rated bonds, or made a conscious decision to hold them, is unclear. In any event, huge losses accrued in lower-rated mortgage-backed securities throughout 2008. In the second fiscal quarter, Lehman reported losses of $2.8 billion and was forced to sell off $6 billion in assets. In the first half of 2008 alone, Lehman stock lost 73% of its value as the credit market continued to tighten. In August 2008, Lehman reported that it intended to release 6% of its work force, 1,500 people, just ahead of its third-quarter-reporting deadline in September. On August 22 2008, shares in Lehman closed up 5% (16% for the week) on reports that the state-controlled Korea Development Bank was considering buying the bank. Most of those gains were quickly eroded as news came in that Korea Development Bank was "facing difficulties pleasing regulators and attracting partners for the deal." It culminated on September 9, when Lehman's shares plunged 45% to $7.79, after it was reported that the state-run South Korean firm had put talks on hold. The next day, Lehman announced a loss of $3.9 billion and their intent to sell off a majority stake in their investment-management business, which includes Neuberger Berman.The stock slid 7 percent that day. Lehman, after earlier rejecting questions on the sale of the company, was reportedly searching for a buyer as its stock price dropped another 40 percent on September 11, 2008. On September 13, 2008, Timothy F. Geithner, the president of the Federal Reserve Bank of New York called a meeting on the future of Lehman, which included the possibility of an emergency liquidation of its assets. Lehman reported that it had been in talks with Bank of America and Barclays for the company's possible sale. The New York Times reported on September 14, 2008, that Barclays had ended its bid to purchase all or part of Lehman and a deal to rescue the bank from liquidation collapsed. Leaders of major Wall Street banks continued to meet late that day to prevent the bank's rapid failure. Bank of America's rumored involvement also appeared to end as federal regulators resisted its request for government involvement in Lehman's sale. The International Swaps and Derivatives Association (ISDA) offered an exceptional trading session on Sunday, September 14, 2008, to allow market participants to offset positions in various derivatives on the condition of a Lehman bankruptcy later that day. Although the bankruptcy filing missed the deadline, many dealers are honoring the trades they made in the special session. Lehman Brothers headquarters in New York City on September 15, 2008In New York, shortly before 1 a.m. the next morning, Lehman Brothers Holdings announced it would file for Chapter 11 bankruptcy protection citing bank debt of $613 billion, $155 billion in bond debt, and assets worth $639 billion. It further announced that its subsidiaries will continue to operate as normal. A group of Wall Street firms agreed to provide capital and financial assistance for the bank's orderly liquidation and the Federal Reserve, in turn, agreed to a swap of lower-quality assets in exchange for loans and other assistance from the government. Lehman's bankruptcy is the largest failure of an investment bank since Drexel Burnham Lambert collapsed amid fraud allegations 18 years ago. Later in the day the Australian Securities Exchange (ASX) suspended Lehman's Australian subsidiary as a market participant after clearing-houses terminated their contracts with the firm. Lehman shares tumbled over 90% on September 15, 2008. The Dow Jones closed down just over 500 points on September 15, 2008, the largest drop in a single day since the days following the attacks on September 11, 2001. The conditions on Lehman's trading floors that day appeared grim; one-third of the sales force were absent. In the United Kingdom, the investment bank went into administration with PricewaterhouseCoopers appointed as administrators. In Japan, the Japanese branch, Lehman Brothers Japan Inc., and its holding company filed for civil reorganization on September 16, 2008, in Tokyo District Court. On Tuesday, September 16, 2008, Barclays plc announced that they will acquire a "stripped clean" portion of Lehman for $1.75 billion. This portion includes the Lehman headquarters building in the Times Square area of New York City, two data centers and the bulk of Lehman's trading and debt security operations, which will become part of Barclays Capital, a division of Barclays plc. On September 20, this transaction was approved by U.S. Bankruptcy Judge James Peck, who stated that, "I have to approve this transaction because it is the only available transaction" with a final reduced price of $1.3 billion (£700 million) after re-evaluation of asset prices. On September 17, 2008, the New York Stock Exchange delisted Lehman Brothers. Its old symbol, "LEH", has been replaced by the new symbol, "LEHMQ" on the Pink Sheets. On September 17, 2008, Paul Brough, Edward Middleton and Patrick Cowley of KPMG China become the provisional liquidators appointed over Lehman's two Hong Kong based units - Lehman Brothers Securities Asia Limited and Lehman Brothers Futures Asia Limited. They are also appointed as the provisional liquidators for three further Hong Kong based Lehman Brothers companies, Lehman Brothers Asia Holdings Limited, Lehman Brothers Asia Limited and Lehman Brothers Commercial Corporation Asia Limited on 18 September 2008. On September 20, 2008, a revised version of the deal, a $1.35 billion (£700 million) plan for Barclays Plc to acquire the core business of Lehman (mainly its $960-million headquarters, a 38-story office building in Midtown Manhattan, with responsibility for 9,000 former employees), was approved. Manhattan court bankruptcy Judge James Peck, after a 7-hour hearing, ruled: "I have to approve this transaction because it is the only available transaction. Lehman Brothers became a victim, in effect the only true icon to fall in a tsunami that has befallen the credit markets. This is the most momentous bankruptcy hearing I've ever sat through. It can never be deemed precedent for future cases. It's hard for me to imagine a similar emergency." Luc Despins, the creditors committee counsel, said: "The reason we're not objecting is really based on the lack of a viable alternative. We did not support the transaction because there had not been enough time to properly review it." In the amended agreement, Barclays would absorb $47.4 billion in securities and assume $45.5 billion in trading liabilities. Lehman's attorney Harvey R. Miller of Weil, Gotshal & Manges, said "the purchase price for the real estate components of the deal would be $1.29 billion, including $960 million for Lehman's New York headquarters and $330 million for two New Jersey data centers. Lehman's original estimate valued its headquarters at $ 1.02 billion but an appraisal from CB Richard Ellis this week valued it at $900 million." Further, Barclays will not acquire Lehman's Eagle Energy unit, but will have entities known as Lehman Brothers Canada Inc, Lehman Brothers Sudamerica, Lehman Brothers Uruguay and its Private Investment Management business for high net-worth individuals. Finally, Lehman will retain $20 billion of securities assets in Lehman Brothers Inc that are not being transferred to Barclays. Barclays acquired a potential liability of $2.5 billion to be paid as severance, if it chooses not to retain some Lehman employees beyond the guaranteed 90 days. History from Encyberpedia and OldCompanyResearch.com (old stock certificate research service).